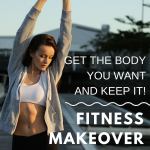 Programs – Fitness Makeover- Better Body, Better Mind! right track to your best body! Boost your metabolism and melt fat quickly! Download a Personal Trainer to your iPod, iPhone or Mp3 Player! Make cardio fun again with intervals, challenges and motivation! See All Audio Cardio Workouts, Click here. All Audio Resistance Training Workouts, Click here. Workout with your Personal Trainer on your schedule at home! DVD workouts feature pre-mixes for you to customize your workouts! Learn More and watch clips.